South Salt Lake continues to expand its craft beer offerings. Even if you're just a casual beer nerd, you've probably noticed there's been an influx of new breweries hitting the state, with the vast majority of them popping up in the capital city. And why not? Salt Lake City is the perfect place for home-spun beer. The population skews young, and young people prefer local establishments rather than chains. Other cities are taking notice of the craft-beer boom happening right now, and are keenly aware of the economic impacts associated with having locally made suds and spirits in their zip codes. One such city that's opening its arms to craft beer is South Salt Lake. It was just a short three years ago that the South Salt Lake City Council instituted a cap of just two breweries in the city limits. Thankfully a new, more forward-thinking attitude has taken root, allowing an unlimited degree of alcohol manufacturing, spurring growth. 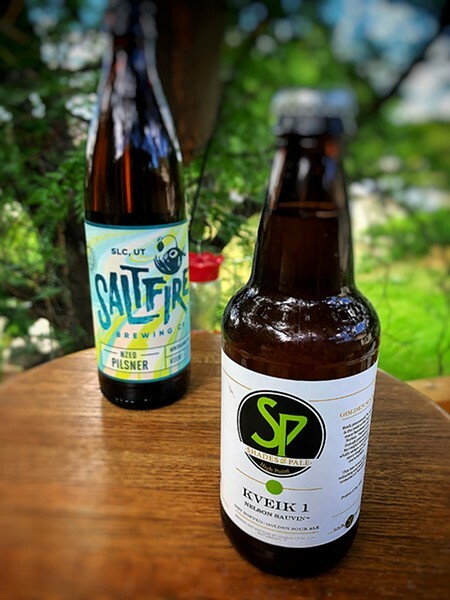 Two of South Salt Lake's breweries are in full swing—and here are two of the latest beers to come out of the SSL. Shades of Pale Kveik 1: The beer pours a slightly hazy peach color with a fizzy eggshell-colored head that fades quickly to a thin edge layer. The aroma has some pine resin and citrus rind hops with a little bit of light fruit, most notably peach and apricot—an appealing nose, for sure. The first sip reveals exactly what the nose is advertising, though the hops take a back seat to the tartness here. I get a little caramel along with bready scone and then unripened apricot notes. There are also some grapefruit hints before the beer moves to a bit of a tart, slightly acidic finish. Overall: On a sourness scale of 1 to 10, I'd put this at about a 6. The flavors in this 6.5 percent beer don't really linger much and it finishes pretty clean for a sour beer. Kveik 1—pronounced "ka-wike"—is the first of three beers featuring the unique Norwegian yeast strain that bears the same name. As soon as the others are released, I'll discuss them here. Saltfire NZED Pilsner: This brand-new beer from Saltfire has a crystal clear, golden straw color topped with two fingers of foamy white head with pretty good retention. The nose is quite aromatic, with a hop profile that ranges from spicy/peppery and herbal, to citrus-like kaffir lime and lemon peel. Notes of biscuit and grain also break out in those initial whiffs. The taste kicks off much like the aroma with a big wallop of hops: herbal, spicy, peppery, grassy, citrus, lemon peel and lime that is wonderfully bitter and round. Sweet, grainy malts come next, adding structure to the hop salad that precedes them, with doses of biscuit, cereal and caramel. The end has a lasting and grassy hop bitterness. It finishes crisp and bone dry. Overall: I thought this was a good brew, and a bolder example of the style. It features pretty much all of the aspects I look for in a Pilsner, and while the flavors are bolder than most in this style, it still offers that nice balance I expect. At 5.4 percent ABV, it's right in line with others of its style, which helps keep the bitterness from becoming astringent. A third South Salt Lake brewery is already in the planning stages, set to be located directly beneath the iconic water tower. The as-yet-unnamed brewery will feature the more popular neighborhood-focused approach to craft brewing, and feature a wide array of both high- and low-point beers. As always, cheers!